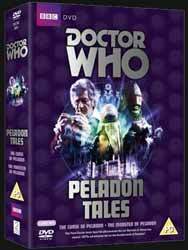 Doctor Who: Peladon Tales brings together both Peladon stories into one triple DVD package. Both The Curse of Peladon (Colour. 1972. 1 hr, 37 min, 55 sec) and The Monster of Peladon (Colour. 1974. 2 hr, 26 min, 12 sec) are Jon Pertwee stories, both are presented in their original aspect ratio, 4:3. The Curse of Peladon was originally transmitted, as a four episode show, between the 29 January 1972 and 19 February 1972. It was the second story of season nine and also starred Katy Manning as the Doctor's assistant Jo Grant. The show was notable for the appearance of David Troughton - Patrick Troughton’s son - in the role of the king. The show was directed by Lennie Mayne and written by Brian Hayles. Both shows were made at a time of civil change, The Curse of Peladon was written a year before England joined the European Union and many of the story's themes reflect the growing debate about the wisdom of this choice. The Doctor and Jo arrive on Peladon at a time of great change, the new king is to be crowned and Peladon is seeking entry into the Galactic Federation. But not all of Peladon’s people think that this is a good idea, worried that their cultural uniqueness will be swallowed up. To celebrate the coronation representatives from some of the more powerful member of the Galactic Federation have arrived on the planet, including Alpha Centauri, Arcturus, and the Ice warrior lord Izlyr with his lieutenant Ssorg. Both the Doctor and Jo are mistaken for the representatives of Earth. Within Peladon's feudal society people have started to die, murdered by a near mythical creature, Aggedor. The king’s closest councillor declares that the planet's entry into the Federation has brought the creature's curse upon them all. However the Doctor suspects that there is a saboteur aboard and initially suspects the Ice Warriors. He soon learns that Aggedor is real, but the threat is coming from an unexpected source. As political allegories go The Curse of Peladon works quite well. The story also represents the show's slow emergence from its own self exile on earth, having concluded that for budgetary reasons it could not compete with the flashier and more expensive genre shows being produced in the States. Given that the original tapes of the show were destroyed in 1975, the restoration team have done a wonderful job at reconstructing the show from NTSC tapes returned to the BBC and a copy of episode three which was lent by Ian Levine. To give the show some depth not one but four monsters are on show. Okay, so the most effective of these is the Ice Warriors and the show allowed their Martian society to be fleshed out a little. The squeaky and camp Alpha Centauri became infamous amongst fans for the aliens phallic shape, a problem not spotted at the design stage. The design for Arcturus, does not fare well as even at its original transmission, it still looked like a plastic brain in a bowl. The monster who is the greatest disappointment is Aggedor himself, from the statues and representations of him around the king's palace, the audience should have expected a powerful and terrifying beast, however, what you get is a man in a furry pig costume. The narrative is well constructed and for once all the major characters get a shot at the limelight, although Jo’s romance with King Peladon feels a little contrived and adds little to the overall story. For an overt political story the show misses on providing any real message, unless it is that people resistant to change will be torn apart by a teddy bear. As well as the show, disc one holds some extras. First up is a full length commentary with actor Katy Manning, producer Barry Letts, script editor Terrance Dicks and production assistant Chris D'Oyly-John. The commentary is moderated by Toby Hadoke. It’s a little meandering at times but gives a lot of background to the show and the time it was made. Next up is The Peladon Saga - Part One (23 min, 25 sec) with the surviving cast and crew recalling their time on the show, including looking at the background to making the show. It’s another thoughtful documentary which places the show in its historical and socioeconomic context. Warriors of Mars (14 min, 56 sec) is a fake documentary about the history of the Ice Warriors, it contains lots of clips from their various appearances, with contributions from both the people who created them and the actors who played the Warriors, including a vocal only contribution from the late Bernard Bresslaw. Jon and Katy (7 min, 09 sec) looks back on the pairing of Pertwee and Manning, as Doctor and Companion with contributions from Katy Manning, Barry Letts and Terrance Dicks. The last full extra is an unusual one for a Who release, Storyboard Comparison (2 min, 16 sec) compares Ian Scoones's original concept paintings with that or the finished show. As with previous Who releases the disc contains the usual PDF materials, a Photo Gallery and in show information text, there is also a coming soon for The Mask of Mandragora. Disc two contains The Monster of Peladon, written by Brian Hayes and directed by Lennie Mayne. The six-part story was originally transmitted between the 23 March 1974 and 27 April 1974. The popularity of the first Peladon story was one of the driving forces for the sequel, though it had been two years between the making of the two stories many of the costumes and props were reused, which made a great link, even though some of these has started to look a little shabby. It is fifty years since the Doctor visited Peladon, in which time he has changed companion’s from Jo to Sarah Jane Smith (Elisabeth Sladen), King Pelador and Hepesh have passed away and the planet is ruled by his daughter Queen Thalira (Nina Thomas), as a member of the Galactic Federation the planet has been drawn into a war with Galaxy 5 and is especially prized as one of the few sources of the mineral trisilicate. Sequels can be a tricky thing, get it right with a distinct story of its own then fans can get to revisit old friends. The problem with The Monster of Peladon is that many of your old favourites return, including Alpha Centauri (as phallic as ever) who apparently seems to have forgotten to go home and has become the defacto ambassador to Peladon; a new set of Ice Warriors in the form of Commander Azaxyr; and of course the cuddly Aggador. But the story is not distinct enough to have warranted making a second Peladon story. In February of 1974 the miners went on strike, only the third time they had done so, with England's dependence on coal for power a struggle ensued between the government and the miners. As Curse had reflected worries about England’s entry into Europe, Monster deals with the lack of change for the mining community during the previous fifty years of Federation membership and the Doctor attempts to stop a civil war between the miners and the aristocracy. The story as a whole has less action and the narrative seems stretched across the six episodes, with much of the time taken up with Peladon’s internal politics. Because of the length of the show the only extra on disc two is the full length audio commentary with Nina Thomas, Donald Gee, Ralph Watson and Stuart Fell, producer Barry Letts, script editor Terrance Dicks and, for episode four only, a commentary by fans Rob Shearman, Mark Aldridge, Kate Du-Rose and Philip Newman. The whole thing is ably moderated by Toby Hadoke. The disc also contains the info text and the subtitles. Disc three is where the extras for Monster are lurking starting with the second part of The Peladon Saga (22 min, 11 sec). This time the show concentrates on the characters and monster in the show with contributions from Katy Manning, Donald Gee, Nina Thomas, Ralph Watson, Stuart Fell, Sonny Caldinez and Nick Hobbs, producer Barry Letts, script editor Terrance Dicks, production assistant Chris D'Oyly-John, sound designer Brian Hodgson and make-up supervisor Elizabeth Moss. The whole thing is narrated by David Hamilton. There are two deleted scenes (1 min, 45 sec) including a recreation of a scene which now only exists as an audio. Where Are They Now? (2 min, 29 sec) is an extract from the show which contains an interview with David Jacobs and Ysanne Churchman, who provided the voice for alien ambassador Alpha Centauri in both Peladon stories. Another substantial extra is On Target - Terrance Dicks (21 min, 28 sec) which looks at Terrance Dicks’s contribution to literature through his work on the Target novels with contributions from Terrance Dicks, writers Paul Cornell, Gareth Roberts and David J Howe, and former Doctor Who Magazine editor Alan Barnes. The extra features readings by Caroline John, Katy Manning and David Troughton. The disc is wrapped up with a photo gallery, the PDF materials and the same coming soon trailer. As a set it's worth getting. Curse is certainly the stronger of the two stories and the restoration work is up to its usual high standards.